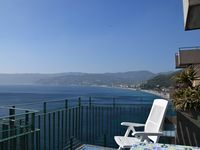 Property 30: Spacious, Airy Apartment in Sunny San Bernardino, Finale Ligure. Property 32: island apartment. 2km from the sea and 10 minutes from the center. Semi-detached house. Property 41: Your house and garden in Noli: sea and history!